Antique nautical clocks from the Chelsea Clock Company are prized by collectors. Clock collectors are interested in two types of nautical clocks; there are nautical clocks that are made specifically for use on board ships plus there are nautical theme clocks that individuals use for home or office decoration. Both styles are indeed called nautical clocks. The typical nautical clock has a distinct shape featuring a round dial with the clock mechanism housed in a cylindrical case which may be made from wood or metal, frequently brass. The nautical clock makes a small footprint with a sloped base that is just slightly larger than the cylindrical top and that either sits flat or is raised on rounded pedestal feet. Of course, there are numerous other styles of nautical clocks. For example, one popular theme is that the cylindrical top can be decorated to resemble a ship’s wheel. Another type of nautical clock is called a captain’s clock. A captain’s clock is enclosed in a wooden case with a lid and, looking somewhat like a large watch, the clock pivots to the desired angle for easy reading. Modern clocks that look like old diving helmets, a porthole, or an old round life preserver, for example, are often found in the category of nautical clocks but in reality these just represent nautical themes and are not true nautical clocks. When actually applied to marine use, the typical nautical clock would be bolted in place on the bridge or at various places on deck. Otherwise the nautical clock without a case would be installed in the instrument panel of the ship. Collectors prize some of the rare nautical clocks that have a special history associated with the ship that actually used the clock. Before the advent of GPS satellite navigation and other modern technology sailors used celestial navigation. In order to determine longitude and latitude from the stars sailors needed an accurate time reading. A precision nautical clock was an essential piece of equipment on a ship. In fact, even though computers guide modern cruise ships the navigator is still required to use a sextant to verify the ship’s position. One of the most famous clock companies that manufactures nautical clocks to this day is the Chelsea Clock Company. Joseph Henry Eastman of Boston, Massachusetts founded the Harvard Clock Company in 1880, which shortly thereafter became the Boston Clock Company. The Boston Clock Company remained in business just ten years but was influential in the development of nautical clocks by the Chelsea Clock Company; Boston Clock Company’s "Locomotive" model may have been the prototype for the Chelsea Clock Company’s "Marine" line of clocks which was introduced in 1897. The “Locomotive” has the same shape and style of the typical nautical clock. The Ansonia Clock Company purchased the Boston Clock Company in 1894. But from the outset in 1880, Joseph Eastman began doing business with the U.S. Navy supplying clocks. Joseph Eastman next established the Eastman Clock Company in Chelsea, Massachusetts in 1894. 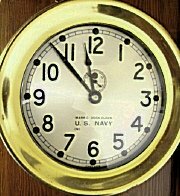 The Eastman Clock Company specialized in marine, regulator, and banjo clocks and the historical record shows that an Eastman Clock Company nautical clock was installed on the battleship U.S.S. Iowa which began construction in 1893. However, the company was sold in foreclosure in 1896 and became the Chelsea Clock Company. Along the way Joseph Eastman was involved with designs and patents for a ship’s bells clock. While Joseph Eastman continued to establish short-lived clock manufacturing companies, the Chelsea Clock Company has survived to this day as the manufacturer of high quality nautical clocks. The Chelsea Clock Company was one of a very few American clock manufacturers to continue producing clocks during World War II because the company furnished nautical clocks for use aboard submarines, destroyers, cruisers, battleships, and aircraft carriers. While other American clock companies experienced severe decline and even dissolution because they made war material instead of clocks during the war, the Chelsea Clock Company was able to capitalize on their strength in the nautical arena to remain as major manufacturer of nautical clocks until the present time. Antique nautical clocks remain as prized collector’s items. However, modern clock aficionados can still purchase a brand new top quality ship’s bell clock from Chelsea Clock Company. Although today’s clock parts are made with modern computerized machinery, the clock movement remains true to the original model of over a hundred years ago.